Home > Uncategorized > Hamilton Beach (49966) FlexBrew Coffee Maker with Thermal Carafe, Single Serve & Full Coffee Pot, Compatible with Single-Serve Pods or Ground Coffee, Programmable, Stainless Steel Only $69.99 + Free Shipping From Amazon! Hamilton Beach (49966) FlexBrew Coffee Maker with Thermal Carafe, Single Serve & Full Coffee Pot, Compatible with Single-Serve Pods or Ground Coffee, Programmable, Stainless Steel Only $69.99 + Free Shipping From Amazon! 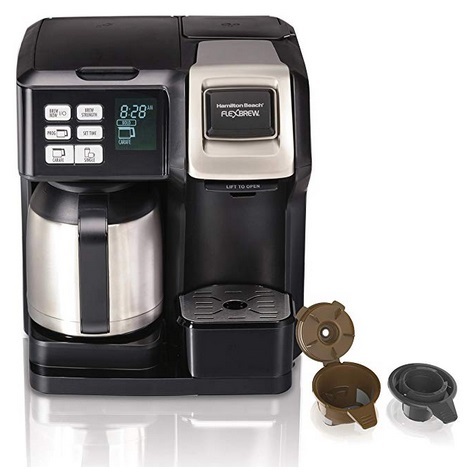 April 15, 2019 Comments Off on Hamilton Beach (49966) FlexBrew Coffee Maker with Thermal Carafe, Single Serve & Full Coffee Pot, Compatible with Single-Serve Pods or Ground Coffee, Programmable, Stainless Steel Only $69.99 + Free Shipping From Amazon! Amazon has the Hamilton Beach (49966) FlexBrew Coffee Maker with Thermal Carafe, Single Serve & Full Coffee Pot, Compatible with Single-Serve Pods or Ground Coffee, Programmable, Stainless Steel marked down to only $69.99 + free shipping! SEPARATE WATER RESERVOIRS. Each brewer has its own water reservoir that’s easy to fill and features a water window so you always know which brewer has how much water. Today Only – Save On Hasbro Games, Baby Alive Dolls, & More From Amazon! Today Only – Save On Sandisk and Other Hard Drives, Flash Drives, Memory Cards, and SSDs From Amazon!